Dubai, UAE, May 02, 2018: The GMC Yukon family of full-size SUVs has been expanded in the Middle East with the launch of a special-edition Yukon to commemorate the model’s 25th anniversary. Offered exclusively on the SLE and SLT model range marked with an exclusive 25th Anniversary badge, the limited-edition 2018 GMC Yukon features a chrome-trimmed premium, personalized appearance with bright chrome accents and body side moldings, including chrome mirror caps, chrome accessory grille inserts, chrome door-handles in addition to polished chrome exhaust tip, chrome tow hooks and 20- or 22-inch polished aluminum wheels. The Yukon Denali has been upgraded in 2018 with a new dimensional front grille as well as a new 10-speed automatic transmission designed to make the most of the engine’s horsepower and torque to optimize the overall performance and efficiency of the SUV. Providing the capability, refinement, safety, performance and connectivity that discerning customers expect, the 2018 GMC Yukon, Yukon XL, Yukon Denali and Yukon XL Denali also feature a new tire fill alert as part of the tire pressure monitor; and are available in new exterior body color. Yukon SLE and SLT models are powered by advanced EcoTec3 engines that deliver more horsepower and torque with one of the segment’s best V-8 fuel economy. EPA-estimated highway fuel economy is 10.4L/100km with the standard 5.3L engine (2WD models). On the other hand, Yukon Denali’s exclusive 6.2L engine makes the most power in the segment – 420 horsepower and 624 Nm of torque. It is matched to a 10-speed automatic transmission that further enhances efficiency and refinement. Inside and out, bold styling advances GMC’s professional grade credentials with elements precision-executed for beauty and function. Yukon’s more aerodynamic exterior also improves highway efficiency and contributes to its quiet ride. The Yukon lineup delivers greater capability and greater refinement through enhanced chassis and suspension systems. A fully boxed frame – composed of more than 75 percent high strength steel – supports a quiet and controlled ride. Projector-beam headlamps are standard on Yukon and Yukon XL. The distinctive Denali models are instantly identifiable by their signature chrome grille and unique exterior appointments, including exclusive high-intensity discharge headlamps. Inside, the Yukon’s precisely crafted interior features a quiet cabin, authentic materials and premium infotainment choices. Examples of attention to detail include a soft-touch instrument panel, console and door panel materials with French seam stitching and purposeful use of ambient lighting. 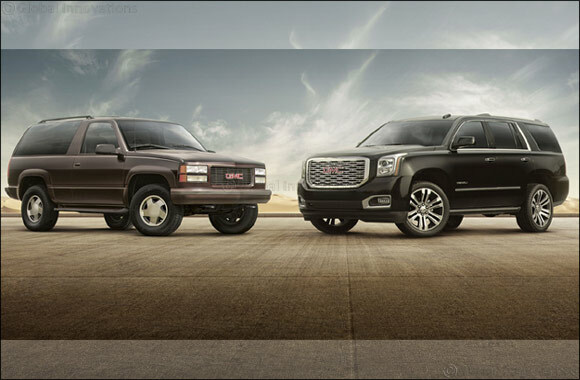 Denali models feature active noise cancelation technology to make the interior quieter. Additionally, phone integration technology enhances connectivity and promotes safer driving through Yukon’s IntelliLink system. The technology allows smartphone users to connect with applications such as navigation, hands-free text messaging and entertainment through the IntelliLink display screen. For Yukon models equipped with the available rear seat entertainment system, the 2018 model year brings a number of modifications and improvements to the connectivity. In addition, rear passenger tablet users get USB port that support 2.1 amp charging atop the already existing USB and 220V AC power outlets. Yukon models are equipped with standard and available driver-alert technologies that add layers of crash-avoidance protection, as well as enhanced occupant protection in the event a crash occurs. They include an Enhanced Driver Alert Package, a forward radar system and the segment’s only Front Center Air Bag, providing added protection for both front occupants in side impacts. When activated, the available Enhanced Driver Alert Package which includes Lane Keep Assist, gently steers the vehicle back into its lane when it detects the driver is inadvertently leaving the intended lane of travel. The package also includes IntelliBeam headlamp technology, which automatically turns on and off the vehicle's high-beam headlamps according to surrounding traffic conditions. Along with driver alert features, standard chassis control crash-avoidance technologies include GM’s StabiliTrak electronic stability control with rollover mitigation technology, trailer sway control, hill-start assist and four-wheel, four-channel anti-lock brakes. Available active safety features use camera, radar and ultrasonic sensors to help avoid crashes. Yukon includes the GM-patented Safety Alert Seat that vibrates if the system determines the driver is at risk of colliding with another vehicle. A rear vision camera is also standard, designed to show the area immediately behind the vehicle in the audio system screen.